In a large bowl, toss all dry ingredients together. With your favorite wooden spoon, mix well to combine. In a small bowl, combine all wet ingredients together. With the same wooden spoon, stir well to combine. Pour the wet mixture into the dry mixture. Using a little elbow grease, stir your granola until well combined; all ingredients will be slightly dampened by the wet ingredients and will be wafting of cinnamon-y goodness. Divide up your granola onto two prepared baking sheets. Leave a few clumps here and there for texture; doesn't have to be perfect. Bake for 35-40 minutes, or until evenly light-golden brown; (I prefer this granola to be on the lighter side of golden; so not too dark toasty brown.) While baking, feel free to open the oven and stir your granola at the 20 minute mark to be sure it browns evenly and/or switch your sheet pans so the pan that was baking on the top rack is now baking on the bottom. This helps the even browning quite a bit. When ready, remove from the oven to cool. 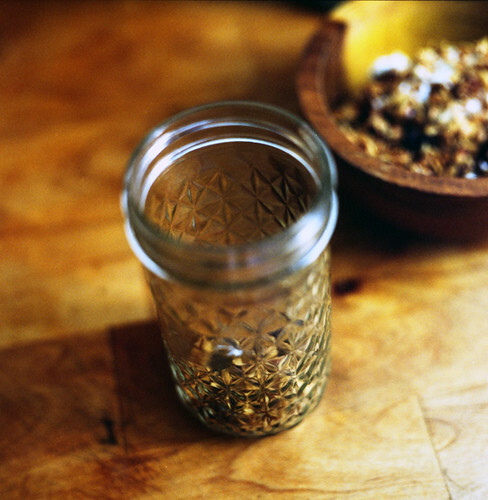 Be sure to stir and break up your granola from time to time, while it's cooling, to prevent it from clumping too much. 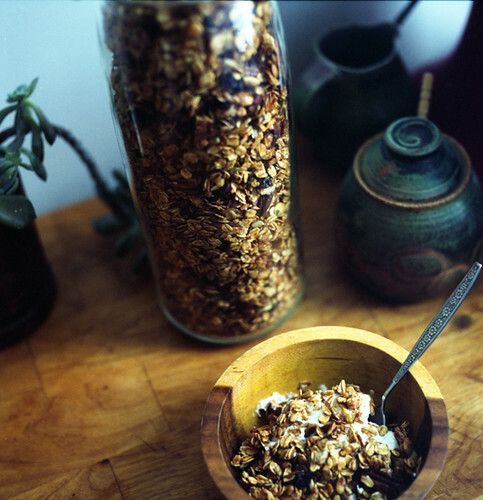 When cooled completely, your granola will be crisp; not quite the sticky & soft stuff you removed from the oven. Store in an air tight bag or container. Refrigerate to keep it fresh. this sounds delicious! i just put dried sour cherries in the granola i made yesterday. it was perfect!